Sorry, Kenny. 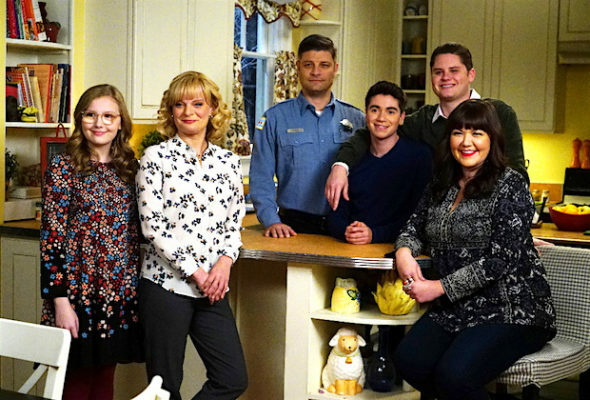 ABC has cancelled their Tuesday night comedy series, The Real O’Neals after two seasons. The sitcom concluded its run in late March. A single-camera comedy series, The Real O’Neals revolves around an Irish Catholic family that seems to be living an idyllic life. Their lives are turned upside down when the middle son comes out of the closet and the rest of the family members come clean with their own secrets. They then start to live their lives more authentically. The show stars Martha Plimpton, Jay R. Ferguson, Noah Galvin, Matt Shively, Bebe Wood, and Mary Hollis Inboden. Real O’Neals debuted as a mid-season replacement in early 2016 and drew mediocre ratings. The network decided to give the series a chance to grow its audience but it didn’t happen. As a result of the lackluster ratings, ABC ordered just three additional episodes beyond the initial 13 installment order. The second season ended up averaging a 0.93 rating in the 18-49 demographic with 3.07 million viewers. The series was not expected to return and the cancellation now makes Ferguson available should comedy pilot Living Biblically get a greenlight at CBS. What do you think? Did you like The Real O’Neals TV show on ABC? Are you sorry that there won’t be a third season? I thought the show was really charming and heartwarming; I enjoyed it a lot. I’d like to see it be picked up on another channel. I really hope it is. I love this show. I love it very much. This is sad. Good that show did not look too funny to me!